Greetings from snowy North Carolina! There is currently a light coating of that oh-so-gorgeous white stuff on the ground and I couldn’t be happier. We spent the entire weekend holed up inside and the only time I got out of my pajamas was to put on new clean pajamas. <— Just keepin’ it real around these parts. Lazy was totally the name of the game and it was glooorious. In addition to all that lazing around, I mayyyy have gone on a bit of a bread making bender. Possibly a little out of hand, but hey. Is homemade bread ever a bad thing??? I think not, friends. I think not. And because stocking my freezer with bread wasn’t enough, I may have also made yet another batch of these healthy banana walnut waffles. Because we blow through them at a slightly ridiculous pace. And I have a feeling you may too. They are light yet filling (especially when topped with a slather of nut butter! 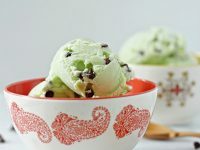 ), and are packed with plenty of banana-y flavor. And! A little extra crunch from the walnuts. Yum-o. Added bonus? They freeze beautifully – perfect for making in advance for those busy mornings during the week! So, let’s get to some tips & tricks for the recipe. As written, the waffles are lightly sweet. I like my waffles and pancakes this way so that I can add plenty of toppings! A little peanut butter, a drizzle of honey and some fruit is soooo good here! 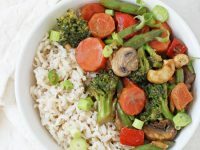 I’d encourage you to stick with the white whole wheat flour for this recipe. This helps keep the waffles on the lighter side (if you use regular whole wheat flour they will be heavier and more dense). This may go without saying, but please use ripe bananas!! 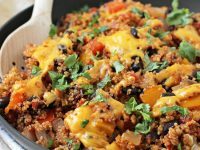 Not only do they mash way better but the flavor really is just so much more wonderful and pronounced. The cook time listed may vary a bit depending on the size of your waffle maker and how brown you cook your waffles. Freezing instructions are down in the recipe notes, but let’s chat reheating. I have a belgian-style waffle maker, so my waffles are quite thick and need a quick defrost in the microwave before popping in the toaster. I typically microwave for about 45 seconds to 1 minute, and then off they go to toast (where they get so awesomely crisp!). Some banana waffles, some coffee, some snow. Winter perfection! 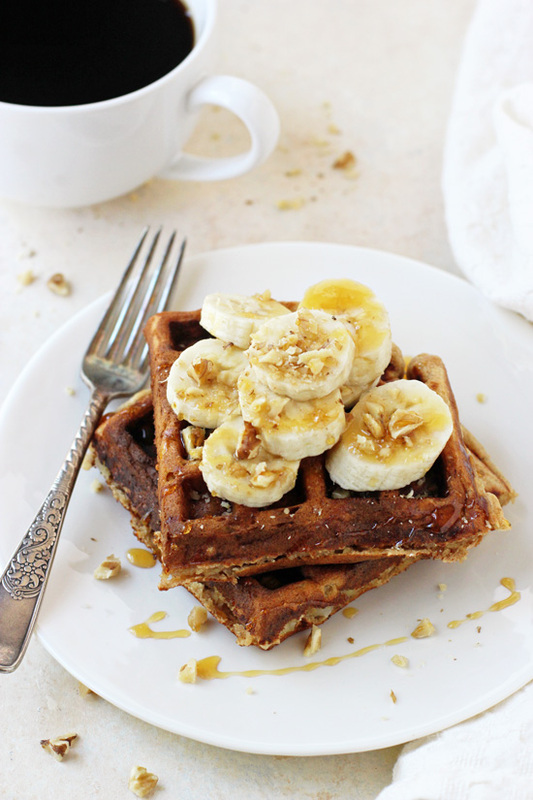 Light & filling healthy banana walnut waffles! These whole wheat waffles freeze beautifully, making them perfect for busy mornings! In a large bowl, whisk together both kinds of flour, the baking powder, salt, cinnamon and nutmeg. In a medium bowl, whisk together the eggs, banana, milk, oil, vanilla extract, almond extract and honey until well combined. Pour the wet ingredients into the bowl with the dry ingredients and mix until just combined (the batter will be a little lumpy). Gently fold the walnuts into the batter. Preheat a waffle maker. Pour the recommended amount of batter into the waffle maker according to the manufacturer’s instructions (making sure you get some of the walnuts each time you pour batter into the iron – they can sink in the batter a bit as it sits). Cook until golden brown. Repeat with the remaining batter. Top the cooked waffles as desired and serve! These waffles freeze really well. Let the waffles cool completely, then wrap each individually in plastic wrap. Add all the wrapped waffles to a freezer-safe plastic bag and freeze! Cook Nourish Bliss. 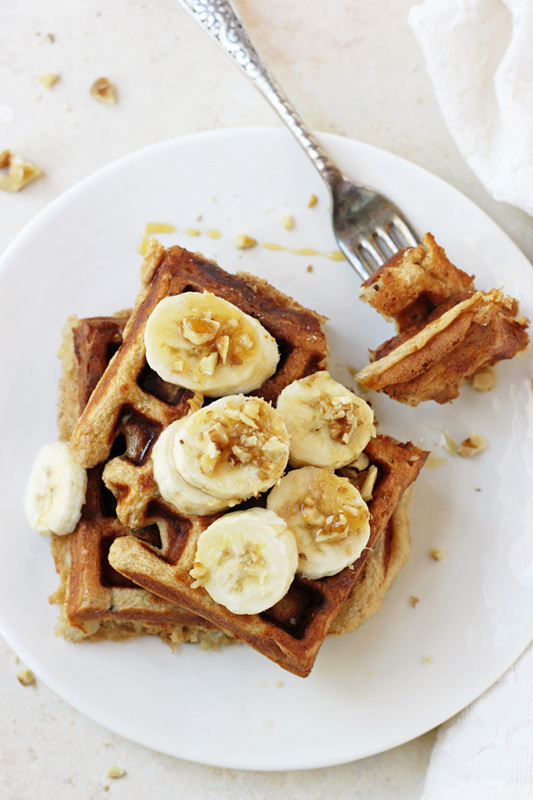 Adapted from my peanut butter banana bread waffles! I want to make these waffles to have tomorrow for breakfast. How can I prepare the batter to be cooked in the morning?? Winter perfection indeed, banana nutty heaven 😀 Happy New Year Ashley! Sometimes when you are snowed in and have an excuse to stay in and be lazy in your pajamas – those are the best weekends ever! These look fantastic! Gaaaah I LOVE North Carolina and its been years since I’ve been there! I can only imagine it’s gorgeous with a fresh layer of snow. 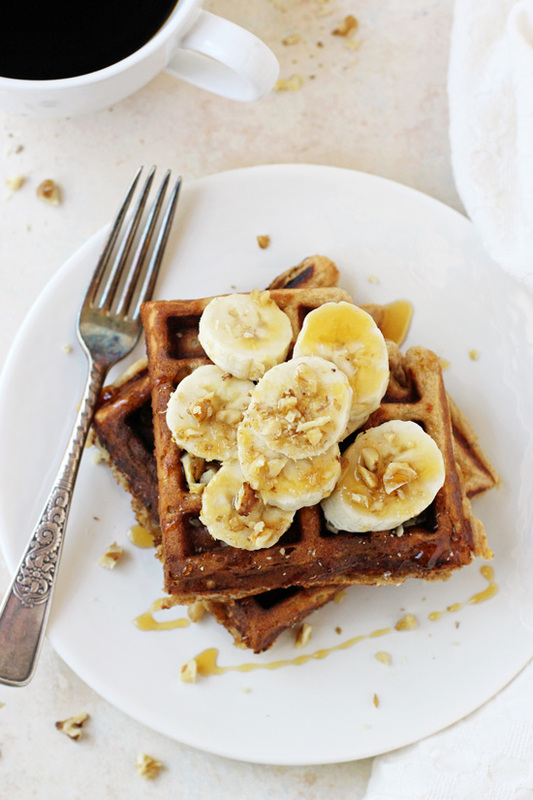 Lazying around in pjs and enjoying a steamy plate of banana walnut waffles sounds like my idea of heaven. Just beautiful! Oh my gosh. So It’s been SO cold here so I am definitely copying you this weekend and doing EXACTLY that. Also, homemade bread?! Literally the best thing ever. I had some today that was baked TODAY from a local small bakery down the road from us and I guarantee if I had alllll of that in my freezer I would just eat that for every meal. Unless of course, I was eating these waffles. I’m such a breakfast for dinner girl I know I would try it for that too. LOVE the walnuts – so genius. GREAT recipe Ashley!! Right?? It’s magical! haha 🙂 Thanks Jessica! Banana Nut is by far one of the BEST flavor combos out there!!! Neither bread baking, nor waffle making is ever a bad thing in my book! I just got a new waffle maker, and we may be going a little overboard with the number of waffles we’re consuming! Love that these freeze well! Haha. I guess in my brain North Carolina didn’t get snow. I guess I was wrong!!! And I’m reading it was in the single digits….whaaaat? Anyhow, these waffles look fantastic. I’ve been on a waffle making spree because it’s the only way to get my kiddos to eat their eggs. Very nice! We usually get about one snow a year – so not exactly a lot (at least by us!)! But yup, it’s been in the single digits and then friday it’s supposed to be 70. Insane weather!! I am so familiar with the pajama to pajama switch. Those days (weekends…) are the best! I love the looks of these waffles. It’s so great that they’re healthy! haha this made me smile! Thanks Alyssa! I love that these freeze well! I usually make pancakes and eat them all in one sitting – ha! 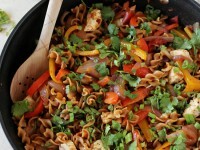 – but I may need to try making these waffles & freezing them for breakfast during the week. And I agree that lazy, bread baking weekends can be quite glorious! I saw that this was for waffles and got so excited because I love making my own waffles…and then I remembered that my waffle maker broke and I need a new one 🙁 sad. But these look delicious! Your weekend sounded so nice and cozy. Staying indoors and getting cozy with a plate of these yummy waffles is my kind of perfect weekend. Love the banana and walnut combo! 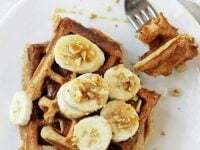 I just made a big batch of whole wheat banana waffles yesterday — it was rainy and it called for waffles! Your snowy weekend sounded very nice as does the homemade bread! These look scrumptious, and spreading nut butter on top is a very good call! I’ve made had banana nut waffles and they sound wonderful, Ashley! We’ve been cooking up a storm this past week and I made waffles this weekend. I do love how you can freeze them and have a great breakfast in minutes next time. I gotta try this. Happy New Year Monica!! haha and yesss to pajamas!! I’ve been eating waffles like it was my job! Ok ok I know am a foodblogger but hey – I haven’t posted any of them as they disappear too quick! I’m always looking for delicious recipes to add to my waffle line up so your post is well timed – thanks Ashley!! And, these sound so delicious! Happy Monday! I also had waffles but they were store-bought frozen. I know, such a shame. I need to go on a waffle making bender and stock the freezer full of these bad boys. They look amazing! haha that’s what usually happens here but it’s been so darn cold that it’s still around. I’ll take it! We’ve been holed up too— I’ve only gone outside to walk my dog lol! Perfect kind of weekend for bread and waffle making 🙂 These look fantastic! And waffles are just perfect for a snowed in weekend for sure <3 Always love freezing any and all baked goodies! Those golden brown crusty edges are totally irresistible! Mmm bread making is never a bad thing! And lazy weekends are the BEST! Especially when there’s snow on the ground. None here in Chicago, though it’s been bitterly cold lately (in the single digits) although tomorrow it’s going to be around 45 degrees…crazy weather! I would love to curl up with a big plate of these waffles. Looks so good, Ashley! I love the addition of walnuts, too! So crazy! It was in single digits here too and then later this week is supposed to be 70. Um what?? And thanks Gayle!